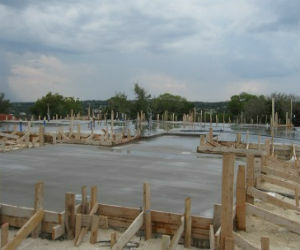 Sterling Custom Homes has been building high-quality green Austin luxury real estate for the last 20 years. Because of the expertise and dedication to detail shown in their projects, Sterling Custom Homes has become the preferred builder for homeowners at The Reserve at Lake Travis. Most recently, Sterling poured the foundation for its second custom home in the community, which is developed by Hal Jones Development Team. The luxurious and elegant home is perched on a cliff and overlooks Lake Travis. The community is nestled among 3.5 miles of shoreline on the southern banks of Lake Travis. Waterfront home sites are priced from the $199’s, and the maintenance-free villas are priced from the $500s. Homeowners in The Reserve at Lake Travis enjoy resort-style amenities including a private Cypress Club Pavilion, lazy river pool with swim up bar, full-service equestrian center and world-class marina for its members. As one of the top Austin home builders, Sterling places emphasis on every aspect of the homebuilding process, knowing that these aspects translate to the home buyers’ lifestyle and enjoyment of their home. From everything down to site selection at The Reserve at Lake Travis, the builder offers advice and design solutions for all preferences. For more information, visit Sterling Custom Homes online or call 512-263-2214. This entry was posted in Featured, Green Design Trends, Green News, News and tagged Austin green homes, new green built home, sterling custom homes on July 26, 2011 by admin.